Dentures are made of either porcelain or acrylic; either way, they are hard and non-porous, just like your toilet bowl, and it's natural to expect a denture-cleaning product to be safe to for cleaning the toilet. A product like Efferdent is safe -- and it's definitely convenient -- but whether it's effective is another question. A cleanser that's safe for your teeth probably doesn't have what it takes to battle toilet germs and stains. Cleaning your toilet with regular cleaners are more effective than using Efferdent. Johnson and Johnson, the company that manufactures Efferdent, does not publish a complete list of the ingredients in Efferdent -- only those that it is required to by law. The only ingredient listed on the Material Safety Data Sheet is Tetrasodium EDTA, which is a chelating agent to soften hard water so that the other ingredients are more effective. Other ingredients, as listed by the U.S. Department of Health and Human Services, include ethylenediaminetetraacetic acid (EDTA), boric acid and potassium monopersulfate, but these are in the old product -- the company doesn't use them anymore. Since the manufacturer keeps the ingredients in Efferdent a secret, it's impossible to tell if the product has enough power to clean your toilet. Some people think it does, and because Efferdent is completely safe for the sewage system, your pipes, your septic tank and your toilet, it doesn't hurt to try. 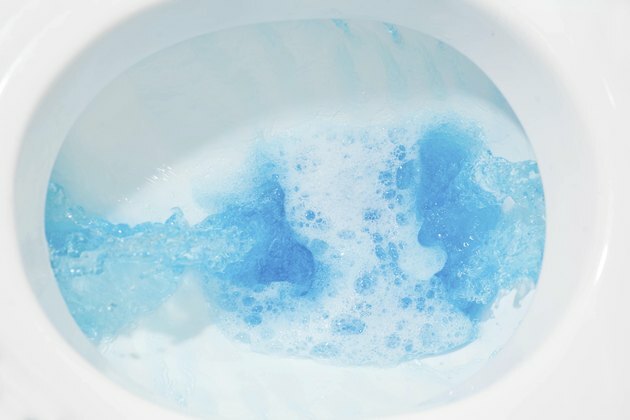 If it works, you'll have found a convenient cleaning option that requires simply dropping two or three tablets in the toilet and letting them work before flushing them away. That scenario is probably a pipe dream, though, because toilet stains require strong disinfectants and acidic cleaners. To use Efferdent, drop one or several tablets in the water -- being certain to flush first -- and let the fizzing action continue for one to several hours. The longer the tablets stay in the bowl, the more cleansing action they will provide. Swish the water around periodically with a toilet brush to spread the cleansing solution onto the rest of the bowl. One problem you might have if you don't agitate the water is that the bowl under the water line will become noticeably whiter than the portion above it. They may be made of similar materials, but toilets and dentures are two different things. If you want a convenient way to clean your toilet, it's better to buy tablets designed for the purpose. They usually go in the tank -- not the bowl -- and while they don't whiten the porcelain, they contain bleach and other disinfectants that you would never use to clean teeth. If your toilet bowl is discolored from mineral stains, you need an acid to remove them, and if the staining is extreme, you need a powerful acid, such as hydrochloric or muriatic acid. Some scrubbing will be involved. Can You Clean a Showerhead With Coca-Cola? Is Toilet Cleaner Acid or Base?